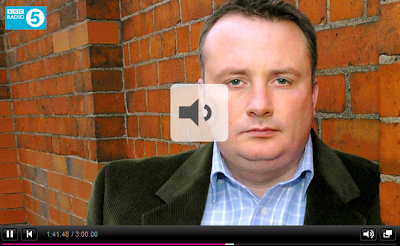 Last night Stephen Nolan interviewed Harriet Harman on his 5 Live phone in programme. I listened to it on my way home from doing the BBC paper review. At times I was laughing so much I had tears running down my face. OK, that's a slight exaggeration, but it really was that bad. Nolan completely eviscerated Harman to the extent that by the end of it she was a jibbering wreck. It really is worth listening to the whole thing (it lasts half an hour). The calls which followed the interview were a joy to listen to. He starts by questioning her about unemployment, moves on to the deficit and finally the Labour scare leaflets. She comes a cropper on all subjects. Destroyed, but Nolan can sometimes go over the top and come across as a wannabe Paxman. I've never really seen Harman put in a solid shift tbh. I couldn't listen to it all, it became too annoying. Just like her Glorious Leader, Harriet Harman avoided answering a single question. She had got her lines and, no matter what she was asked, she was going to deliver them. First time ever I was inclined to feel sorry for her. But she is such a hectoring harridan the feeling quickly passed and I am much better now. Nolan, (a man who`s Labour bias usually has me shouting at the radio), really did take her to task. Although it pains me to say it, well done The BBC (on this occasion). I listened to it earlier, it may have been a touch harsh but this is exactly the type of questioning the big guns should be receiving on a more regular basis. It's a shame that this interview doesn't seem to be mentioned on the main newspaper websites. harriet, late of st pauls girls school, is a tragic example of what happens when aristocratic inbreeding meets a priviliged education and pushes the brain beyond its capacity. she really is not very bright, but due to her schooling has a veneer that would carry her through as a high street solicitor dealing with your conveyancing, but really cannot cut it. when she is not engaged in her procrustrean mania to equalize everyone and has to talk detailed numbers or policy her mouth runs ahead of her brain, with the inevitable comedy gold consequences. no wonder mandy told her he didn't want to hear another word out of her for the duration. if only the rest of us were so fortunate. I agree - hopeless performance, she was very unconvincing, full of evasion and half-truths. Any comments on Friday night's Paxman's interview with David Cameron. I thought he was very unconvincing, full of evasion and half-truths. Eviscerated: Gosh wheres my dictionary? Nolan can be a bit too aggressive. Paxman has a more subtle assault, however strange that might seem. Just finished listening to it. She was absolutely savaged but brought it on herself with her inability to answer the questions put to her. A truly abysmal performance. One of the worst from a mainstream politician I have ever heard. I don't think he was hard enough on her. If he had succeeded in getting her to cry, it would have gone some way to satisfying my visceral craving for the utter destruction of the likes of harman. He talks about the 1.7M jobs that went to non British workers. What is rarely mention these days is the report by the Lords on the effects of immigration. The report concluded that as a GDP per taxpayer we were no better off. So the only effect of immigration is that the country got more crowded! Who's been prattling about the need for more upfront Labour women? Bring them on! After Harman all we need is Mrs Balls and that's the election sorted, then. Harman lied on national radio "Conservatives threatened to withdraw services" she would not back it up. They are not called Liebour for nothing. I see the "taking money out of the economy" village economics is alive and well as once again adumbrated by the BBC. Yes it was amusing enough, but beating Harman in an argument is about as impressive as beating Frank Spencer in a DIY competition. She really came over very, very badly indeed. Thanks for pointing to this, Iain. So if you do not explicitly state in your manifesto that you will not do something, then we can assume that you will do it? I hope this broadcast is cached somewhere or other, so more people can hear it during the coming week. She starts off well though, nicely on message and using all the right phrases but it all falls apart within moments and she started criticizing 'political commentators' and broadcasters, which probably wasn't a good idea. Thank you, oh thank you. I now understand how it is that, despite their best efforts to conceal it, the Conservatives are ultimately responsible for a sixteen year unemployment high, the collapsing economy, political incompetence, parliamentary malfeasance, female bullying, pensioner bashing, child abuse, 9/11 et cetera, et cetera. Nolan wields his questions like a butcher's knife and flays Harman with every stroke. Wonderful stuff! Iain,please listen to Jeremy Hunt's appearance on Friday's Nolan show. It was actually worse than Harman. Yes. If I'd been conducting this interview I'd have tried to make her cry. Now we have heard it all - this woman is the thickest of the thickest,her male equivalent being Woodward. You can actually her thinking which word to use next as she tries to string a sentence together. On the economy this nonentity is not just clueless,she lacks the first understanding of any basic economic theory. Harman is as guilty of all Brown's thugs for the state of this nation. Also liked the bit at 2:10:40 where she says "They [Tories] threatened to take it away" when talking about the leaflets and pensioners free TV licences and winter fuel allowances. Nolan just kept nailing her. Thank you so much Iain, for making access to this possible. Stephen Nolan has made me go all gary-nevilly as a result of his hard-hitting but FAIR questioning. "Strange... no anti-Tory BBC bias squeals that I normally see in this blog..."
Stephen Nolan can be as biased (or as balanced) as he wants, just so long as I do not have to pay for it. Loved the harrumph at 1:54. Harman clearly thinks people are stupid, or should I say she thinks the dumbing down of the population since the 1940's has been, on the whole, a success. For shame, Harriet, for shame. That woman has a vacuum where her brain and moral compass used to be. I wonder who removed them......? This was like the Yes/No interlude: you have 30 minutes to answer questions without saying yes or no. This was a complete monstering. And for the record, Harriet, George Osborne guaranteed free tv licences & the winter fuel allowance at conference last year. Nolan did a marvellous job. I especially enjoyed the challenge over scaring OAP's with their leaflets when he said he could put out a leaflet saying Labour intended halving their pensions etc because the Labour Manifesto didn't say they wouldn't. How I wish the good people of Peckham would fling her out. It would be almost as wonderful as seeing Balls get beaten. Oh God this was absolutely brilliant. She sounded as though she had got away from her nurse for the night and was off her medication. I loved the comment "Perhaps you dont understand my Irish accent but you havent answered this question four times now." What's all this "Nolan's a bit too aggressive" nonsense is hear coming from assorted posters? That's about as relevant as saying Nolan's got too many guns (one can never have too many) or that he used too much explosive (another impossibility). Lying scumbag politicians (of all stripes) have avoided answering straight questions by abusing the politeness of their interviewers for far too long. Politicians should never be able to walk into a tv studio without feeling their guts churn in fear. From the moment they arrive to the moment they leave they should experience nothing but pant-crapping terror at the thought they might be exposed for the lying mountebanks they really are. And so what if Paxo is more subtle than Nolan? That just makes the game even more fun. To steal an analogy from cricket: A good skipper varies his bowling lineup, making his opponents face a bewildering onslaught from a spread of brutal fast bowlers, cunning spinners and deceptive middle pacers. We need Paxmen AND Nolans, it's just a shame the broadcasters don't have more of them and only let the few they have out of their boxes occasionally.